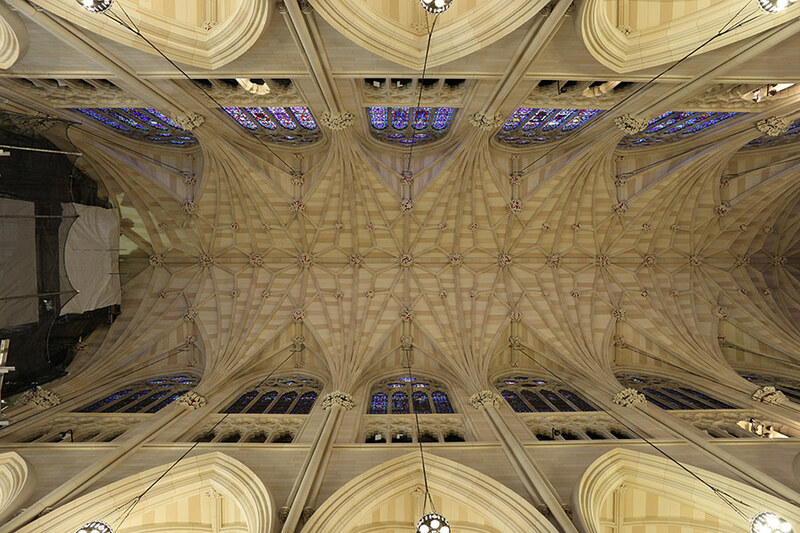 Shrouded in scaffolding for three years, St. Patrick's Cathedral’s renovation is nearly complete. Initiated in 2006, renovations stalled due to the 2007 economic recession, but began again in earnest in 2012. Why now? The Archdiocese of New York was concerned about stone falling off the aging structure. They commissioned New York’s Murphy Burnham & Buttrick (MBB) to spearhead the renovation with a mandate to repair, stabilize, and preserve. Built in 1879, the original structure was designed by James Renwick Jr., one of 19th century America's preeminent architects. MBB’s Jeffery Murphy, the renovation's lead architect, stresses that the St. Patrick's Cathedral project is "conservation, not restoration. "While restoration brings a building back to a specific style or time, conservation incorporates features from multiple time periods to display a full history of the space. There are features of the building that are now integral to its appearance but were not part of Renwick’s original design. In the 1940s, for example, archways made of Georgia marble were added to the Fifth Avenue entrances, lending a different character to the building’s exterior. 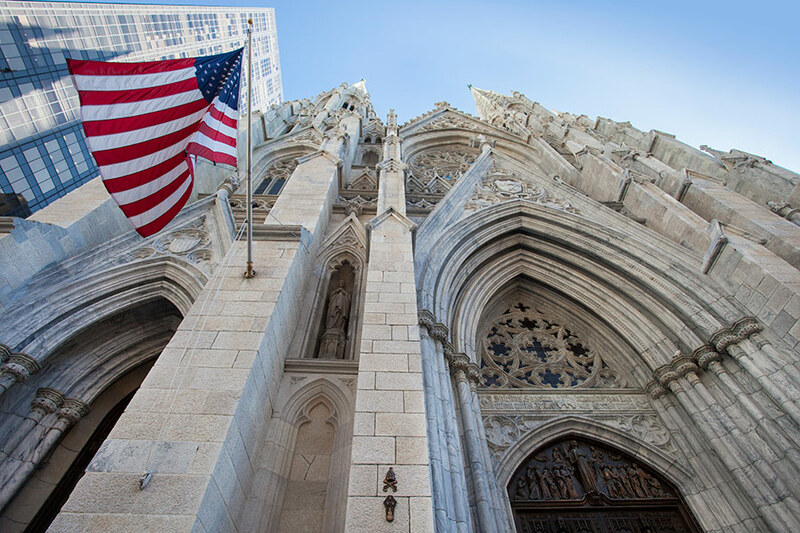 St. Patrick’s Cathedral is beloved locally and protected nationally: The cathedral, as well as the rectory, Lady Chapel, and Cardinal’s residence on the same block, are National Historic Landmarks, a designation reserved for iconic structures with national historical significance. Uncovering Renwick’s original style with only fragmentary visual evidence of the original structure was the project’s overarching challenge. Commenting on the renovations, Monsignor Robert Ritchie referenced Cardinal Dolan's opinion that "the conservation of St. Patrick's Cathedral is about spiritual renewal." During renovations, the church continued to welcome tourists and worshippers. Priests held the usual seven masses per day, calibrating their voices over the construction noise. The project is also a financial commitment for the Archdiocese, which estimates that interior and exterior renovations have cost $177 million so far. Over nine years, approximately 140 designers and consultants, along with a team of 20 engineers, oversaw more than 30,000 interior and exterior repairs and modifications to the structure. 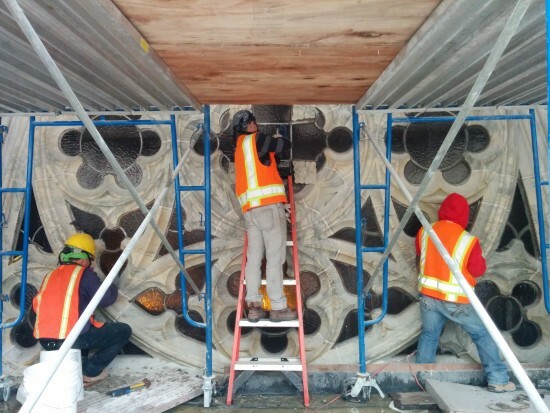 Sustainability plays a major, and visible, role in the conservation process. The Archdiocese has invested in green energy, with ten geothermal wells planned for the site. The wells extend 2,200 feet underground, and will provide a 30 percent reduction in energy. Raymond Pepi, founder and president of New York’s Building Conservation Associates (BCA), led the forensic analysis of the site. The team took an archival, rather than a decorative, approach to the conservation, matching current conditions as closely as possible to their historic origins. The team conducted materials analysis on hundreds of paint samples, scrutinizing each under a microscope to reveal the original color. Once determined, historic paint colors were calibrated again to be seen accurately under (much brighter) modern-day lighting. That level of analysis was applied to every piece of woodwork, plaster, stone, and glass. So far, around 150 masons, painters, carpenters, and other builders have labored on the project. At times, there were over 100 people working at once on the cathedral. To coordinate the activity, MBB partner Mary Burnham said the team used Autodesk’s BIM 360 Field, an app that enables each team member to identify problems, flag repairs, suggest conservation methods, and allows the design team to follow up on the work as it was completed. Transparency, inside and out, is a salient feature of new design elements. Monsignor Ritchie is emphatic that the Cathedral keep its doors open to all. New programmatic elements include sliding glass doors at the main entrance on Fifth Avenue so that, even in winter, the 9,000-pound double bronze doors flanking the entrance may remain open without letting in the cold. Pollution, particularly candle soot, turned the ceiling and parts of the walls army green (low smoke candles are the norm going forward). Pepi pointed out some of the quirks of the structure that the renovations highlight. St. Patrick’s, unlike textbook Gothic cathedrals, lacks flying buttresses. Renwick intended to create the ceiling in stone, but, when construction resumed post Civil War, stone was too expensive. The ceiling was done in plaster, instead. Lighter than stone, the concrete ceiling no longer required structural support from the flying buttresses. The renovations reveal the original tri-colored ceiling that Renwick cleverly designed to look like stone. The interiors were curated to increase the space's comfort and reduce visual clutter. Signs and statuary were repositioned to harmonize with the space. Preservationists restored the glass and glazing on 3,200–3,300 stained glass panels in situ. MBB vented the bottom of the windows to improve air circulation, and maintain a more even temperature around the delicate glass. While most of the glass would have been severely damaged by removal, approximately five to six percent of panels in need of intensive repair were removed and shipped to master glass restorer Ettore Christopher Botti of Botti Studios (Chicago). The exterior received the same level of scrutiny and care. The renovation team scrubbed the facade with Rotec, a gentle (25 PSI) spray of glass and water, to reveal any damage to the building. 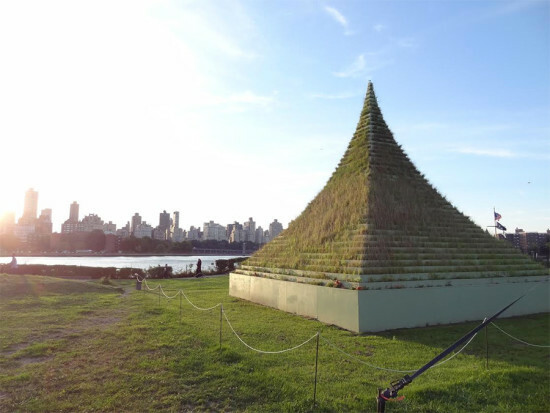 The original structure, said Murphy, was supposed to look as if it was "poured into a mold and deposited on the sidewalk." Uneven aging of the stone and grout caused the exterior to appear more variegated than intended. The current, cleaned facade recaptures the 1879 look of the building. 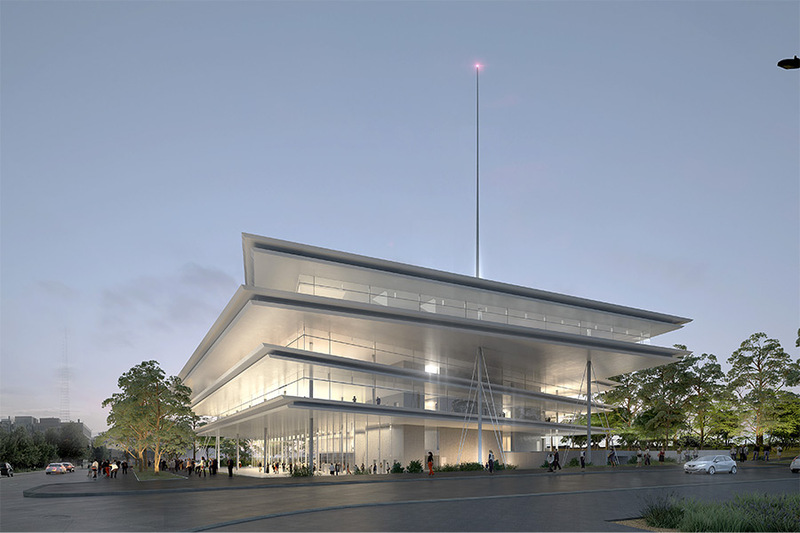 Kum & Go HQ gets the Renzo Piano treatment. The Menil Collection. Parco della Musica Auditorium. 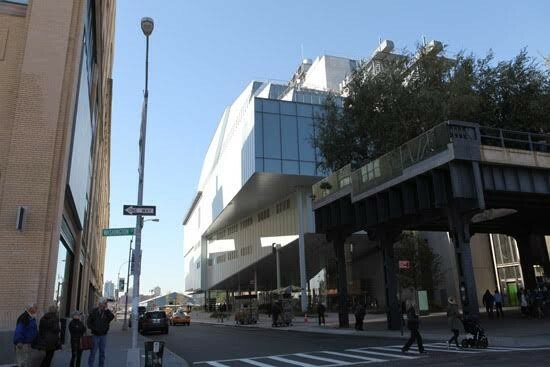 The new Whitney Museum. The Art Institute of Chicago. And, now, Kum & Go Headquarters. Renzo Piano’s latest client is the family-owned, Des Moines, Iowa-based convenience store chain Kum & Go. 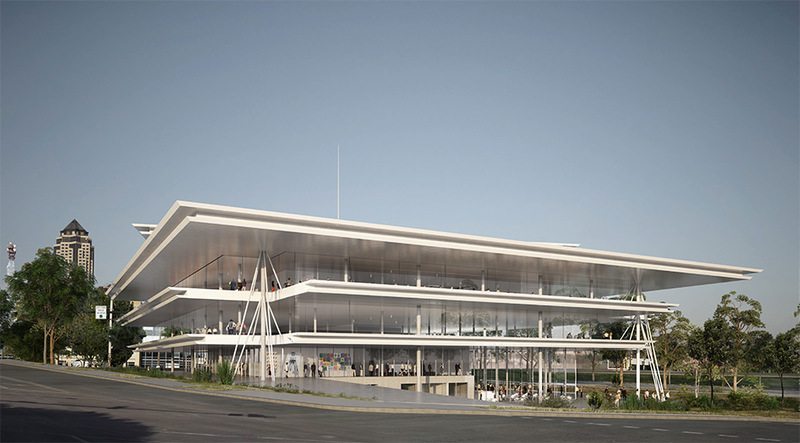 His contribution to Des Moines will further move one of the region’s most prominent businesses from a suburban campus choked by cars and cul-de-sacs into a redeveloping district featuring a public library by David Chipperfield and a sculpture park by New York-based architects Mario Gandelsonas and Diana Agrest. Piano’s design packages all the features that an ever-widening base of clients come to him for. Its strong, terraced horizontal lines hint at the indigenous Prairie Style, lightened with span after span of floor-to-ceiling glass. 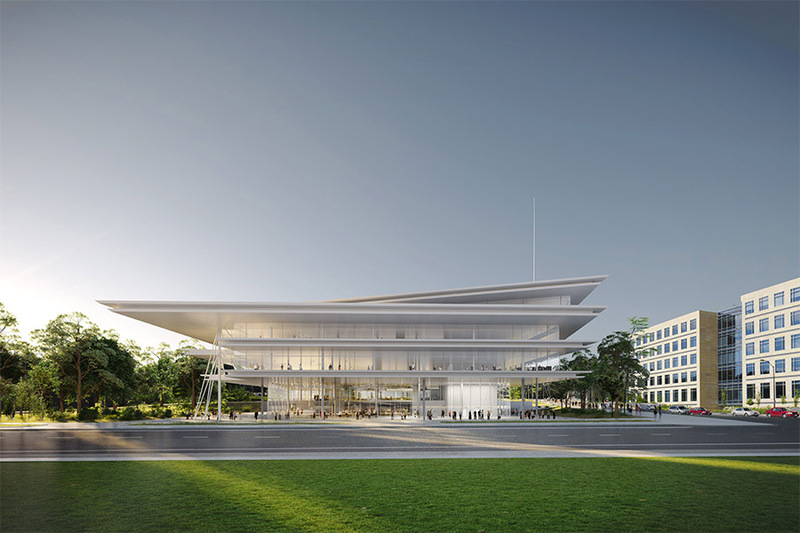 The five-story building (complete with rooftop garden) is suspended over a glass-walled entrance pavilion via a series of thin steel columns, offering Piano’s best chance in this project for his hallmark structural poetry. Boasting expansive Prairie Style terraces and a wealth of glass, Piano’s building is expected to open in 2018. 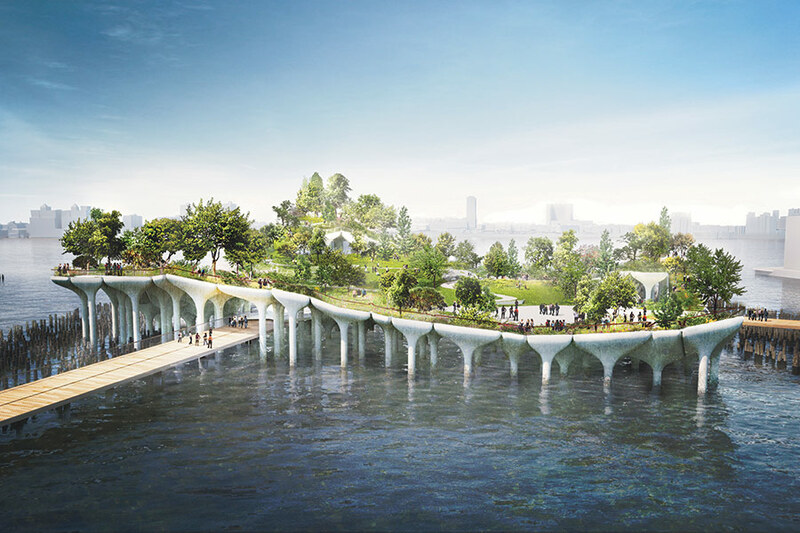 Project manager Danielle Hermann of OPN Architects (the local architects of record) says the plan is intended to have the “building floating over the landscape.” The approximately $100 million project will begin construction late this fall, and is expected to be complete by 2018. 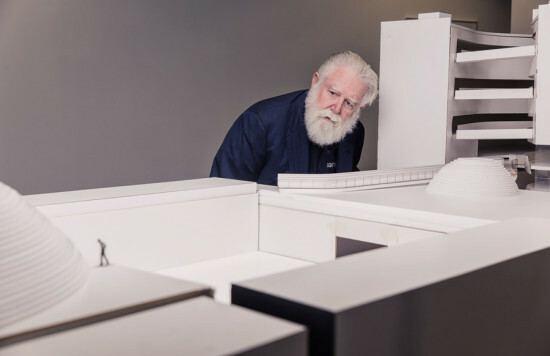 A third of the four-acre site will be taken up by Piano’s building, leaving ample room for a landscaped, privately-owned public park space that will serve as an extension to Gandelsonas and Agrest’s Pappajohn Sculpture Park across the street. 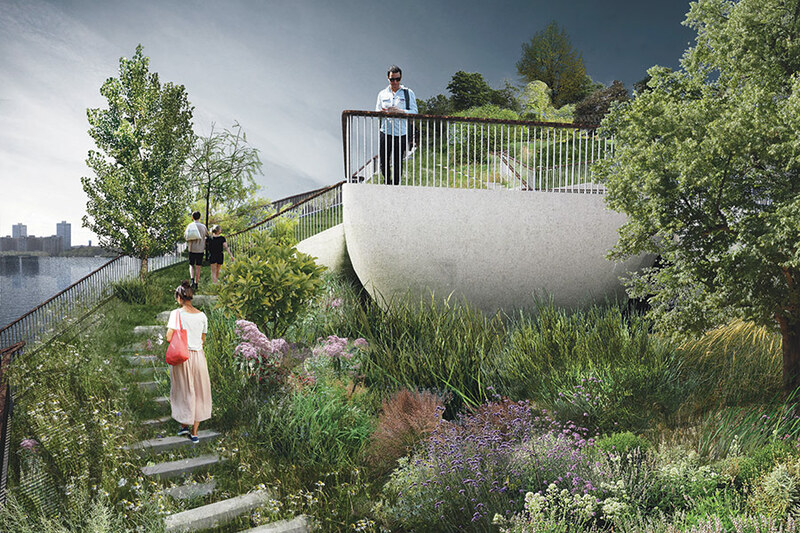 Piano’s plan is designed to defer to the sculpture garden, while offering cool, shady outdoor space that complement the topography next door. The Kum & Go building “should serve as a community connector and really fit well in the site—to serve as a natural, artful extension of the Pappajohn Sculpture Park,” said Kum & Go CEO Kyle Krause. 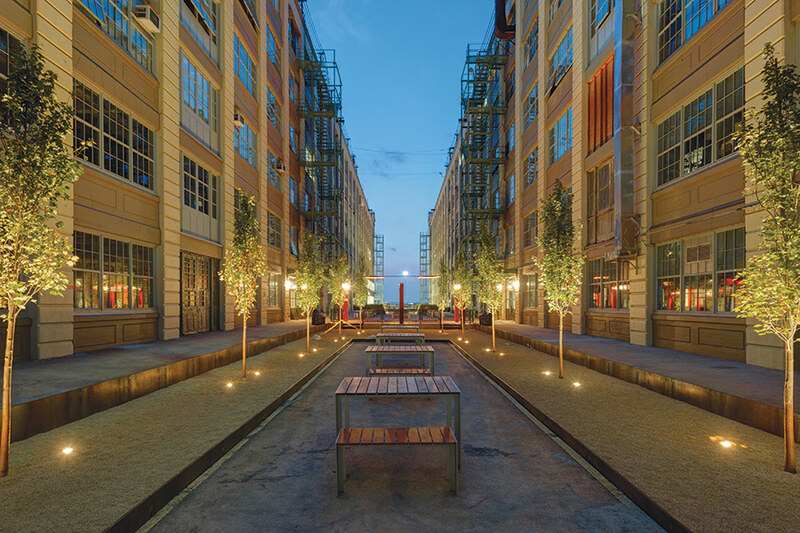 The neighborhood, called Gateway West, is a master-planned area of redevelopment, and a building by a Pritzker Prize–winning architect could be its crown jewel. Beyond Kum & Go and the sculpture park, it hosts the Chipperfield library, several other corporate headquarters, and a raft of new restaurants, several of which have been installed into adaptively reused buildings. 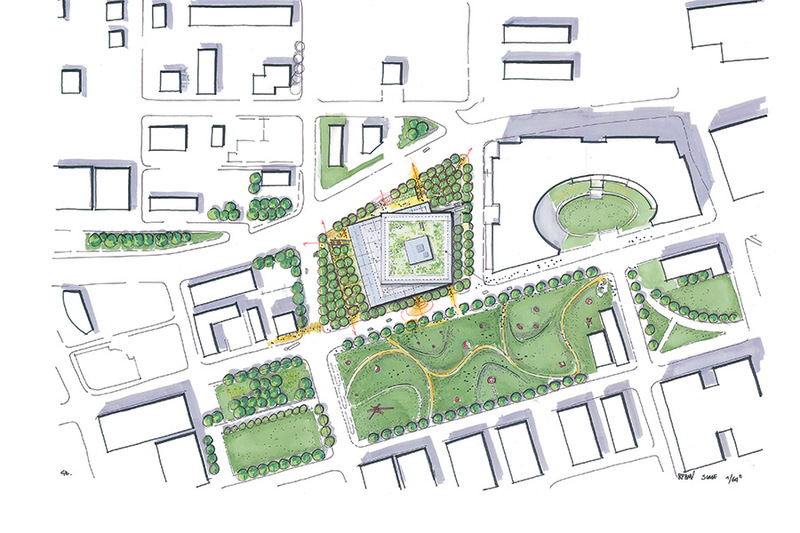 Previously an undefined edge-zone abutting the corporate, modernist highrises of downtown, “It’s creating a new place in the city of Des Moines,” said Erin Olson-Douglas, an architect with the city who works on economic development and urban planning. Krause’s family will own the building, with Kum & Go (who operate 100 LEED-certified gas stations) as a tenant. Krause proffered the vision for moving the company into the city center from the suburban campus they were rapidly outgrowing. Inspired by Zappos CEO Tony Hsieh (who moved his company from the suburban fringe of Las Vegas to its downtown), Krause wanted to harness the same urban energy that comes through chance encounters in active, vibrant places, according to the company’s senior vice president of store development Nikki DePhillips. Shrouded in scaffolding for three years, renovations on St. Patrick's Cathedral are nearly complete. Initiated in 2006, renovations stalled due to the 2007 economic recession, but began again in earnest in 2012. Pope Francis' upcoming New York visit advanced the project timeline. The Archdiocese of New York commissioned Murphy Burnham & Buttrick to spearhead the renovation. Built in 1879, the original structure was designed by James Renwick, Jr., one of 19th century America's preeminent architects. Jeffery Murphy, the renovation's lead architect, stresses that St. Patrick's Cathedral is "conservation, not restoration." While restoration brings a building back to a specific time, conservation incorporates features from multiple time periods to display a full history of the space. 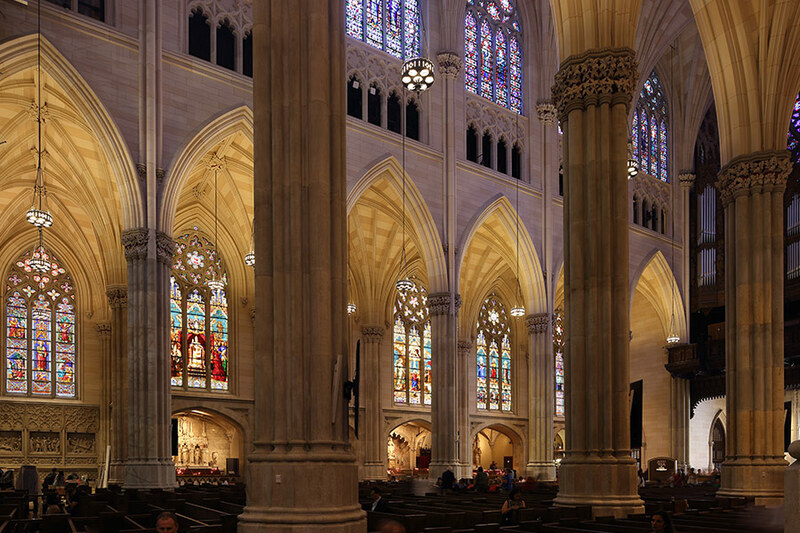 Commenting on the renovations, Monsignor Robert Ritchie referenced Cardinal Dolan's opinion that "the conservation of St. Patrick's Cathedral is about spiritual renewal." During renovations, the church welcomed visitors and held its usual seven masses per day. The project is also a financial commitment: the Archdiocese estimates that interior and exterior renovations have cost $175 million so far. Over nine years, approximately 140 designers and consultants, along with a team of 20 engineers, oversaw more than 30,000 interior and exterior repairs and modifications. Raymond Pepi, founder and president of Building Conservation Associates, led the forensic analysis of the Cathedral. That analysis enabled the design team to make restoration and conservation decisions on the basis of the strength and integrity of the building's woodwork, plaster, stone, and glass. So far, around 150 masons, painters, carpenters, and other builders have labored on the project. At times, there were over 100 people working at once on the Cathedral. 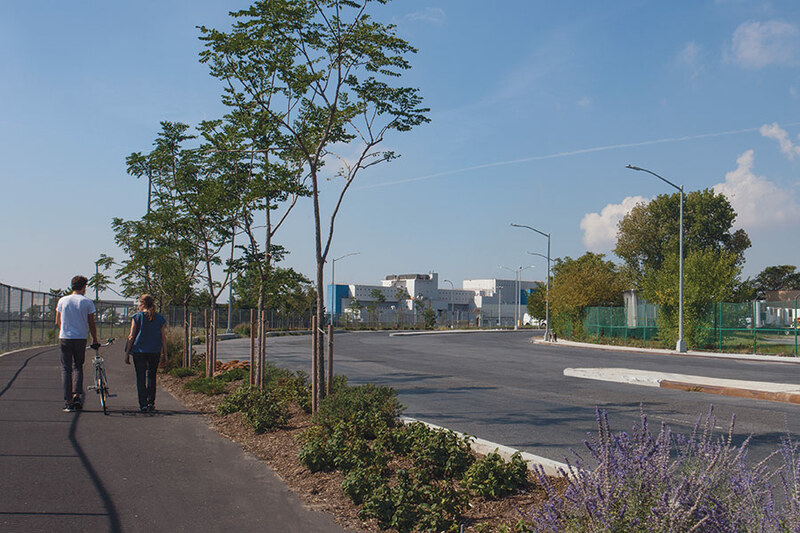 To coordinate the activity, architect Mary Burnham says the team used BIM 360 Field, an app that allows each team member to identify problems, flag repairs, suggest conservation methods, and allow the design team to follow up on the work as it's completed. Transparency is a salient feature of the new design. New programmatic elements include sliding glass doors at the main entrance on Fifth Avenue so that, even in cold weather, the 9,000 pound bronze doors to the cathedral are always open. The team blasted the facade with a mixture of glass and water to reveal any damage to the building. The original building, says Murphy, was supposed to look as if it was "poured into a mold and deposited on the sidewalk." Uneven aging of the stone and grout caused the exterior to appear more variegated than intended. The current, cleaned facade recaptures the 1879 look of the building. The interiors were curated to increase the space's comfort and reduce visual clutter. The design team worked with the clergy to eliminate plastic signage and statuary placed haphazardly in the interior. Signs and statuary were repositioned to harmonize with the space. Preservationists restored the glass and glazing on 3,200–3,300 stained glass panels in situ. Approximately 5 to 6 percent of panels were removed and restored by Ettore Christopher Botti of Botti Studios. Significantly, the Archdiocese of New York has invested in green energy, with ten geothermal wells planned for the site. The wells extend 2,200 feet underground and will provide 30 percent of energy for cathedral. A long time ago, in the wake of World War II, Los Angeles appeared as a welcoming paradise for returning veterans and footloose others in search of new beginnings. Jobs beckoned and commuting by car or transit was manageable. There was not yet heavy traffic or smog; there was only sunny days and the promise of suburbia—the good life. The only thing missing was affordable housing. People slept in makeshift Quonset huts and tents in city parks, while lines to purchase new makeshift houses formed over night and snaked for blocks. Then, as now, city government expressed concern and did little. 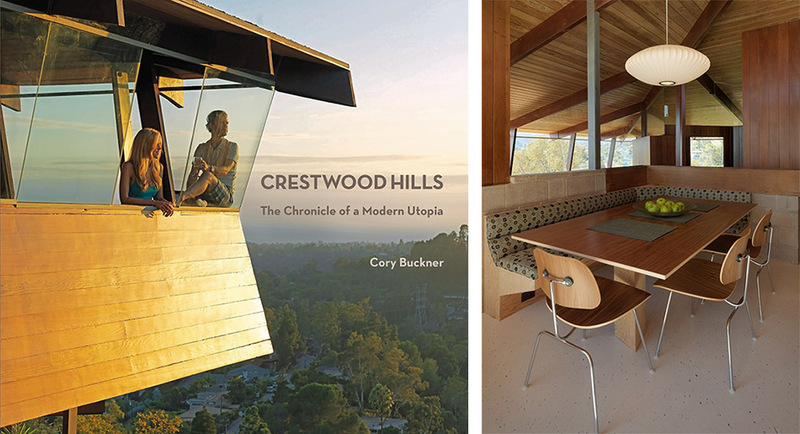 Crestwood Hills: The Chronicle of a Modern Utopia by Cory Buckner tells the story of an optimistic approach to housing from the period, when four returning veterans who bonded as studio musicians decided to build a cluster of neighboring homes for themselves, sharing some common play space and a swimming pool. Other musicians became interested, and the group, christened as the Mutual Housing Association (MHA), grew to 25, then 100, and after some publicity, to 500. People eagerly signed up, and by the end of 1946, with some bickering and conservative diatribes, Los Angeles had its first large-scale cooperative housing development. As author—and not incidentally architect—Buckner astutely writes, the goal of the MHA was not to build tacky houses, but rather “innovative structures that could be erected simply and cheaply and that reflected the politically progressive visions of the founding members.” A design team consisting of Whitney R. Smith, A. Quincy Jones, and Edgardo Contini was selected, and plans grew to include—in addition to the community swimming pool—tennis courts, nursery schools, and a cooperative market. 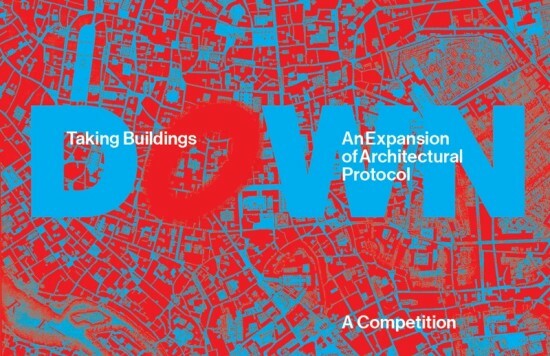 In time, other architects became involved, retained by individual cooperative members with designated sites. 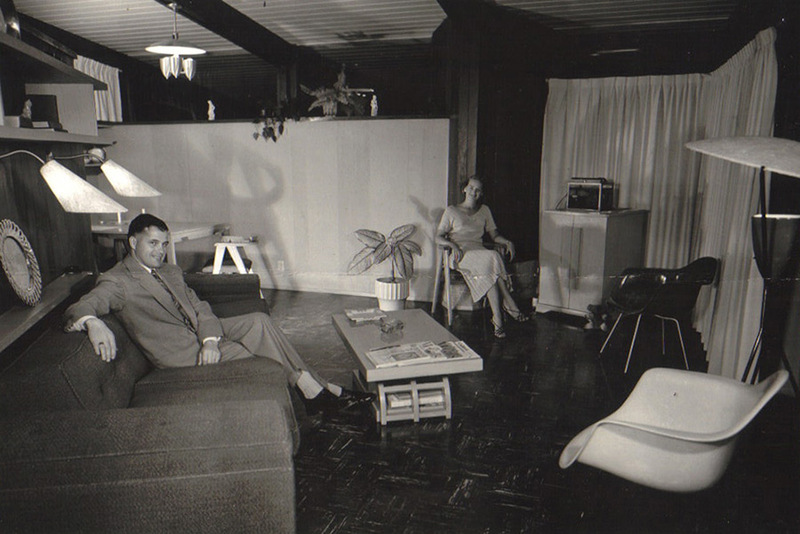 The living room of the Hamma House in Brentwood, a model of modern design guidelines. A hilly, raw 1,800-acre tract above then-rural Brentwood was purchased, and 350 lots were bulldozed. Construction began by 1950, despite a recalcitrant Federal Housing Administration (FHA) and its insistence on discriminatory race restrictions—supposedly meant to protect their investment, but eventually ruled unconstitutional by the Supreme Court. Several members resigned from the MHA over this issue, which also undermined several similar efforts at the time in northern California. 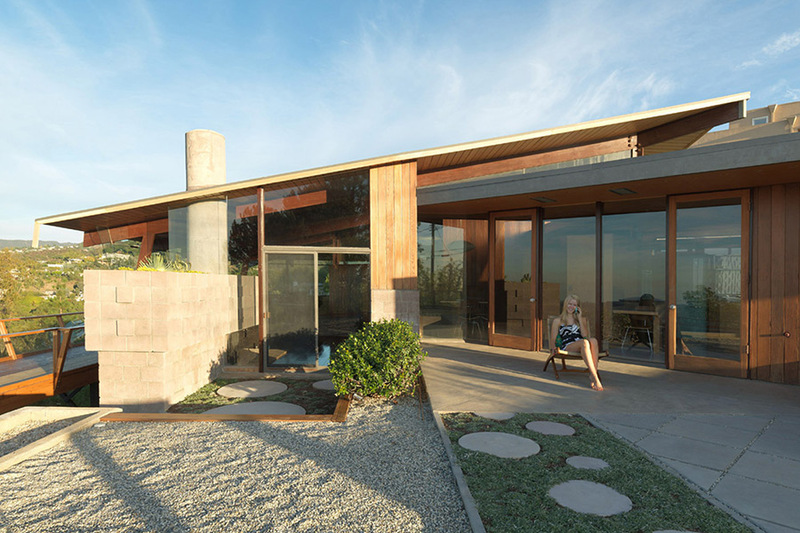 The FHA also initially opposed the cooperative’s modernist design guidelines, which were based in part on LA’s famed Case Study Houses. Only a delegation of architects and others lobbying in Washington D.C. reversed that restriction, and today, despite the ravages of fires and insensitive owners, 47 remaining designs distinguish Crestwood Hills as a designated Los Angeles Historic-Cultural Monument. 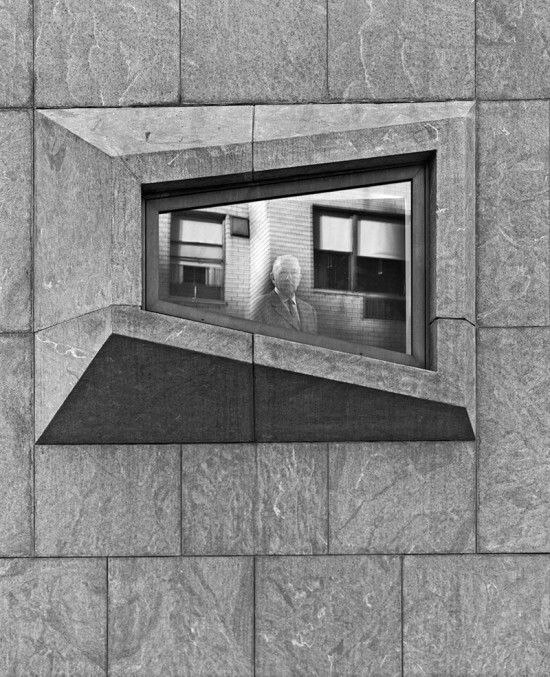 Buckner, who with her late architect husband Nick Roberts restored three of the landmark homes, details the community’s architecture, aided by a wealth of photos and illustrations. The total is a rich history of a unique community that distinguishes Southern California’s oft-overlooked social and architectural heritage. From the strange bedfellows files: Musician Pharrell Williams has enlisted Zaha Hadid as a partner to rejuvenate a rather staid athletic shoe. The rubber toecap of Adidas' Superstar design has been remodeled by Hadid. The white version of the shoe features a fan-like 3D motif, while a raised pattern of dots and dashes decorates the black kicks. While AN doesn't pretend to dictate high fashion, we can definitely see pairing up Zaha's sneakers with Renzo Piano's Whitney handbag for an au courant look. The shoes are slated to be in stores August 7. Hadid and other notable architects are no strangers to the world of footwear design. Take a look at our past of architect-designed shoes here.